As the red tide continues to linger off the South Texas coast, the Texas Sea Grant College Program at Texas A&M University is collaborating with two other Texas universities to test the effectiveness of unmanned aerial vehicles, or UAVs, to monitor these harmful algal blooms. 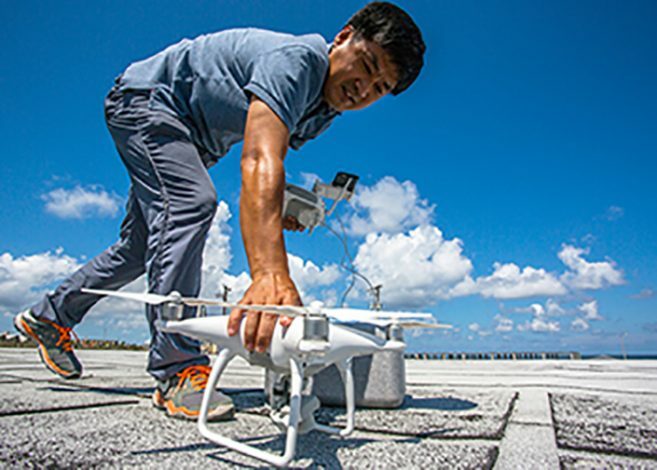 Tony Reisinger, the Cameron County coastal and marine agent for Texas Sea Grant and Texas A&M AgriLife Extension, asked Jinha Jung, an assistant professor in the Department of Engineering at Texas A&M University-Corpus Christi, brought two UAVs to the lower coast in late September. Jung flew the two UAVs out of the University of Texas Rio Grande Valley Coastal Studies Laboratory on South Padre Island. Each spent 20 to 25 minutes in the air, flying about half a mile out to sea and back while recording video and a series of still images. The first, a DJI Phantom 4 camera drone, used a natural color sensor; the second, a 3D Robotics RTF X8+ Multicopter, was outfitted with thermal and multispectral sensors. A multispectral sensor captures data from different parts of the electromagnetic spectrum, including outside the spectrum visible to humans. A bloom of toxic algae called Karenia brevis causes red tides in Texas. There is growing interest in the agricultural applications of UAV remote sensing, but it also may have the potential to assess algae bloom movement, cell density and fish kills, the latter useful in determining fisheries resource impacts, Jung and Reisinger said.